When Mick Jagger and the rest of The Rolling Stones left their steady gig rocking the feisty crowds of young Brits at Giorgio Gomelsky's Crawdaddy Club, Gomelsky surprised everyone by deciding he wouldn't move along to manage The Stones. Instead, he realized he had an audible rock and soul hole to fill in putting together a new house band. And in 1963, he took it upon himself to become the earliest manager by helping to form the next British Invasion sensation, The Yardbirds. Although they would get lost in the international shuffle with The Rolling Stones and The Beatles dominating the charts, thankfully it seems that many decades later we're finally realizing just how important they were as a band with their unique blend of soul, R&B and later early psychedelic rock that became the group's signature. Consider the talent that was involved in one time or another as Parke Puterbaugh wrote in his Greatest Hits, Vol. 1 liner notes, "By now, everyone knows the Yardbirds legend, if not their music; the band graduated three of the great Ph.D.s of rock guitar: Eric Clapton, Jeff Beck and Jimmy Page." In their brief five year period, the band became a regular musical fixture in the West End of London club scene and cranked out a remarkable number of hits including "For Your Love," "Heart Full of Soul, "I'm a Man," "I Wish You Would," "Shapes of Things," "My Girl Sloopy," "Train Kept Rolling," "Over, Under, Sideways, Down," and "Dazed and Confused," which band-mate Jimmy Page later made even more famous with Led Zeppelin ("whose original moniker was the New Yardbirds" as the DVD booklet notes). Known as "The Most Blueswailing Band," the group initially fought to get out of the limelight of The Rolling Stones by distinguishing themselves as something entirely different in a series of successful live shows. However, because they were such a club sensation, The Yardbirds struggled with taking the faster, harder, and louder atmosphere of their live raucous recordings and transfer that same energy to a record. Using a rigid twelve-bar blues sequence-- The Yardbirds, much like The Animals later-- employed a remarkably unique and very soulful sound to their work. 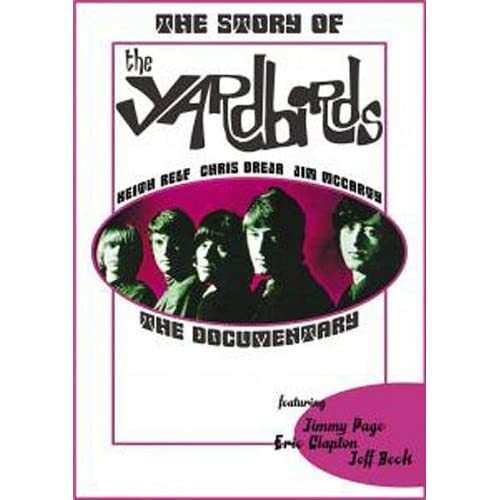 And in the Yardbirds' case, it was accentuated by their bluesy reliance on a harmonica and inventive rock guitar riffs whether it was using a violin bow or testing the limits of their short-lived guitarist Eric Clapton, along with Jeff Beck, and Jimmy Page who would all go on to create legendary bands of their own. While the lineup would change, their commitment to the music reigned supreme as they designed more impressive hooks and as Puterbaugh shared, they served as "the bridge betwen the tributary white R&B of early-sixties London and the pastures of fuzz-toned pschedlia and power-chord heavy metal plowed much later in the decade and throughout the seventies." And indeed, just by watching this fascinating roughly hour long documentary that utilizes rare interview footage, archival performances, and candid details from numerous members including Jeff Beck, you can see the vast influence that the varying guitarists had on the landscape of music. Although I must admit that it was bittersweet when you realize that the band's voice and frontman-- harmonica extraordinaire Keith Relf has passed away (from an electric guitar shock at home in the '70s) since you can't imagine anyone else singing "I'm a Man... I spell M-A-N... man." Despite this, it's wonderful to explore their musical contributions that are so easily lumped together with other '60s British bands and overshadowed by the main two-- The Beatles and The Stones. And while it's highly recommended to anyone who loves classic rock-- the best part of the DVD was actual hidden mong its bonus footage as we witness a live concert filmed on March 31, 1967 for German TV. Originally shot for the program "Beat -- Beat -- Beat", this concert reveals their stamina and power as we watch the guys command an audience who doesn't speak their language (and indeed the intro and commentator rattles away in German without subtitles) by quickly jumping into an awesome fourteen minute set of songs featuring Page on guitar that'll leave you breathless and eager to try and track down their albums. Of course, it'd be a dream if all the British Invasion bands would be given the crisp audio and digital DVD and CD treatment in a fan friendly box set, in the meantime, guitar enthusiasts, fans of Page, Clapton, and Beck, as well as the rest of the 'Birds won't want to let this one fly out of the yard.